When I first traveled to Chitwan, I thought I had fallen into a horrendous tourist trap. It was hot, I didn’t see any animals, and I endured a really, really long and bumpy bus ride to get there. Fast-forward a few years and at the urging of friends, I decided to give this place another try. I’m so glad I did. This time, I spent two nights at a beautiful resort. Candlelit dinners, organized excursions, a swimming pool, and smiling faces greeting me with scented towels and refreshing drinks. Call me a Chitwan convert. Go, I say. And use these tips to avoid the tourist traps and have an unforgettable stay in Chitwan. My first visit was on a bus. A bus that took a good half day from Pokhara. A very hot bus that seemed to never end. For my most recent visit, I flew. In fifteen minutes, I was at the airport walking towards happy hotel staff helping me with my luggage. Sure, the flight was bumpy and the passenger next to me became ill, but I would choose those fifteen minutes over that extended bus ride any time. In my opinion, the price difference is totally worth it. 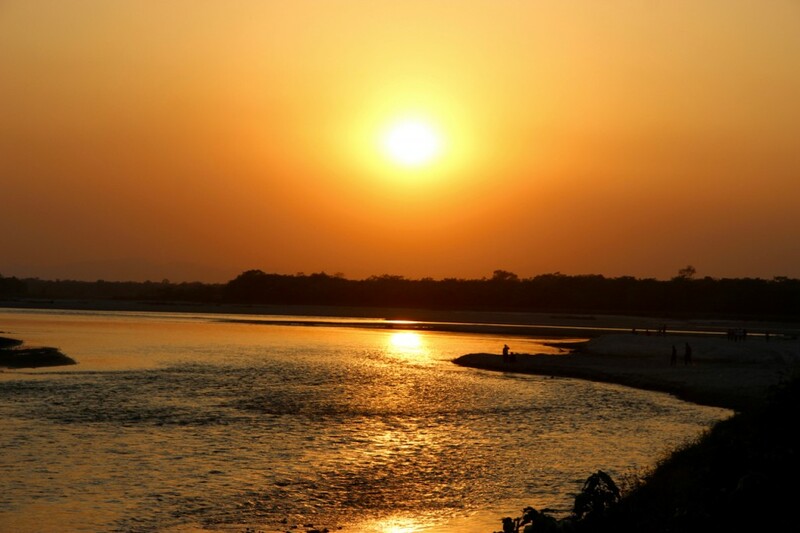 Familiarize yourself with the main areas of Chitwan. Meghauli, home to many luxury resorts, is about a 40-minute drive from the airport and on the banks of the river. Sauraha is a bit more dense, but with plenty of accommodations for budgets of all sizes. There’s also the small village of Barauli, in the western part of Chitwan, which is very quiet but has a couple of good accommodation options, including a community homestay. Most hotels or homestays offer package deals for two and three-night stays. Though at first glance, resort prices may seem high compared to other areas in Nepal, keep in mind that activities and food are often included. Be prepared for some hidden costs, however, as many establishments count on you to spend money on overpriced drinks and additional safari tours. My final thought on hotels: It will most likely be hot. Pools are always a good choice. My second visit to Chitwan was focused on relaxation. I wanted to refresh and chill, so the idea of sitting in a Jeep for four to five hours wasn’t something I was eager to do. I passed on the Jeep safari and chose to hang out with elephants and at the lodge, instead. It is possible to see animals (I saw three rhinos, two kinds of deer, all different species of birds, and some coyote-hyena-thing) without stepping foot in a 4×4. I woke up early one morning to stroll through the surrounding village. For obvious reasons, life beyond the gates of the luxury hotel was a lot different. Lands are plotted thick with banana trees, and houses are clustered along the main roads. I was greeted by locals and stared at by curious families, and smiling children wanted to practice English with me. This is a beautiful way to get to see more of Chitwan. One of Nepal’s highlights is the variety of cultures, customs, religions, histories, and traditions. Chitwan is no different. The Tharu tribe has braved the jungle, battling mosquitos and jungle animals to tend fields and build homes made from clay, mud, and grass. This group developed their own social structure, with village chiefs managing intricate maps of irrigation canals bringing water to communities’ farmlands. Most hotels and resorts organize cultural performances and arrange tours to local villages. As with any place in Nepal, ask questions, watch, be curious, and act with respect. The colors of dusk are phenomenally vivid in Chitwan. My hotel organized a sunset boat trip for me, surprising me with cold drinks and snacks to nibble on the banks of the Rapti River. I was told sunrise is an equally enchanting time. Whether you are a morning person or a night owl, the boat ride is peaceful and serene and reveals a whole different aspect of the park: sleeping crocodiles and villagers hauling baskets of elephant grass across crystal-clear waters. Elephants are equal parts thrilling and terrifying. I was so captivated by “Kali Rani” (Black Queen) that I made plans to see her twice. Standing next to an elephant is an incredible, unforgettable experience. I was thrilled to watch this giant animal wade into the Rapti River, bathe, drink, and squirt water on her trainer and me. 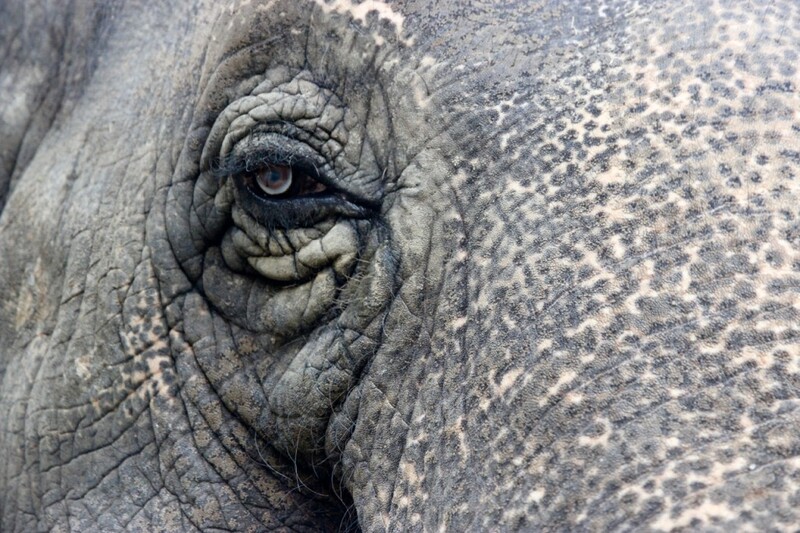 When she came out of the river, we fed her elephant sandwiches — grassy husks tied around grains and rice. Nights are quiet in Chitwan. Aside from chirping birds and the occasional rustle of leaves, evenings are peaceful. Ideal for dinners beneath the stars. My lodge placed old lanterns and candles throughout their property, creating a warm, romantic ambiance for visitors. Travel in Nepal isn’t always easy, and Chitwan is a great place to reward yourself with pampering and TLC. If you’re going to splurge in Nepal, Chitwan is the place to do it. Sauraha is a village of Ratnanagar Municipality in Chitwan District and Chitwan Valley, in the Province No. 3 of southern Nepal. It is a very popular tourist destination. The village is the eastern gateway to the nearby and large Chitwan National Park, that project is part of the Terai-Duar savanna and grasslands ecoregion. It is near the East Rapti River, and 23 km (14 mi) east of Narayangarh city. Beginning literally like a small and quaint village of daub huts, houses, and hotels, it has grown into a small town with hotels, resorts, restaurants, internet cafes, and gift shops. Sauraha has good road access for private-rental vehicles. Air connections to Sauraha are through Bharatpur Airport, with regular daily air services from Pokhara and Kathmandu. The airport lies just 15 kilometers to the west of Sauraha. Will need to change to a bus, a jeep or a taxi for connection to Sauraha. Via Kathmandu — there are three types of buses available. Cheaper Birganj bound buses which will drop you at Tadi Bazaar about 4 kilometers north of Sunauli where you can easily get a local bus, taxi, rickshaws, tanga/pony carts. These second bit more expensive type is the direct tourist buses that are no more comfortable than normal intercity except they are full of tourists. A third type is more comfortable air-conditioned buses (Greenline, etc.). All buses will travel via Mugling, Narayangarh/Bharatpur, Tadi Bazaar, Sauraha; (4–5 hours trip). Via Sunauli / Bhairahawa — on eastern bound (Birganj/Biratnagar) buses traveling through Butwal, Bharatpur, Tadi Bazaar. Change to a local bus, jeep, pony cart, or rickshaw to Sauraha (3 – 4 hours trip). Via Pokhara — direct tourist buses are available via Mugling, Narayangarh / Bharatpur, Tadi Bazaar, Sauraha (3 – 4 hours trip). Jungle/wildlife safaris by foot, jeep, and elephant. You may see a rhinoceros, deer, monkeys, and Bengal tiger. Bird watching in and around the jungle, especially Bishazari Tal, a wetland approximately 10 km north-west of Sauraha. The park headquarter is in Kasara. HQ holds the main administrative activities. Other administrative activities are done in its eastern sector Sauraha and in its western sector Amaltari. The park protection works have been doing by the Nepal Army. There are altogether 47 security posts, among which 16 are park staff only and 13 are Nepal Army only. Grasslands and waterholes play key role in the management of precious wildlife of CNP. Grasslands are being converted into shrublands and forests resulting in a decrease of grassland area from 20% in 1970s to about 5% in recent years. However, the invasion of Mikania micrantha (Banmasa i.e. forest killer or mile a minute) is becoming more and more aggressive to grasslands and other ecosystems. Grassland ecosystem is very dynamic. It is readily affected by floods, fires, grazing and manual cutting. The increase in the Saccharum spontaneum (kans) type of grassland is considered to be the highest quality habitat for wild herbivores especially the rhinoceros and the deers. It is also a major source of elephant fodder on one hand and a preferred raw material for paper pulp. Break-up tall grass stands into patches work of tall grassland and short grassland is crucial for wildlife conservation but the work is challenging. Khagendramalli, Chappachuli, Amrite, Padampur, Dumaria, Jarneli, Sukebhar, Bhimle, Budhirapti, Buddanagar, Kachuwani, Ghatgain/ Lamital, Devital and Khoria Mohan are the major grasslands of Chitwan Natinal Park. Lack of record of grasslands and their characteristics, and invasion of grasslands by unwanted species are the major issues in the grassland management. Cutting and uprooting of unwanted species and removing of invading trees from the grasslands. Grass cutting in a massive way and removing of unwanted species from newly created Padampur grassland. This area was a human settlement since 2000. An entry fee of NRs. 1500/- (Foreigners), NRs. 750/- (SAARC), and NRs. 100/- (Nepalese) per person has to be paid at the Park’s Entrance Gate. Flora and Fauna of the park are fully protected and must not be disturbed at any cost. Do not purchase illegal animal or plant products. The purchase of illegal animal or plant product may bring you to the legal prosecution. The visitors of the park must respect the religious and cultural sites all around the park. The visitors are required to place the trash in the rubbish bins and should care about the cleanliness. The visitors are strictly prohibited to walk within the park between sunset and sunrise. The park offers interesting sites and activities. The display at the Visitor Center at Sauraha provides fascinating information on wildlife and conservation programs. The Women’s User Group souvenir shop offers a variety of handicrafts and other local products for gifts and souvenirs. Elephant safari provides an opportunity to get a closer view of the endangered One-horned Rhinoceros. One may also get a glimpse of the elusive Bengal tiger. The Elephant Breeding Center at Khorsor, Sauraha gives you information on domesticated elephants and the baby elephants born there. The museum at Kasara, the park headquarters, has informative displays. Near the HQ, visitors can see Bikram Baba, a Hindu religious site of archival value. A short walk (1 km.) from the park HQ will take you to the Gharial Breeding Center, which is also home to the Marsh mugger and a number of turtles. Inside the park, there are 7 resorts run by park concessionaires that can provide lodging and access to wildlife activities. Various resorts and lodges situated outside the park also offer a variety of services. The Chitwan valley is characterized by tropical and subtropical forests. Roughly 70 percent of park vegetative cover is Sal (Shorea robusta) forest, a moist deciduous vegetation type of the Terai region. The remaining vegetation types include grassland, riverine forest and Sal with Chir pine Pinus roxburghii. The later occurs at the top of the Churia range. The riverine forests consist of Khair (Acacia catechu), Sissoo (Dalbergia sissoo) and Simal (Bombax ceiba). The grasslands are mainly located in the floodplains of the rivers and form a diverse and complex community with over 50 different types of grasses including the elephant grass (Saccharum spp. ), renowned for its immense height. It can grow up to 8 meters in height. A total of pdf 68 species of mammals, 56 species of herpetofauna and 126 species of fish have been recorded in the park. The park is especially renowned for its protection of One Horned Rhinoceros, Royal Bengal Tiger and Gharial Crocodile. The park harbors not only the world’s largest terrestrial mammal (wild elephant) but also the world’s smallest terrestrial mammal (pygmy shrew). A total of 544 species of birds has been recorded so far including 22 pdf globally threatened species including critically endangered Bengal Florican, Slender-billed Vulture, White-rumped Vulture, and Red-headed Vulture. The park has a range of climatic seasons each offering unique experience. October through February with an average temperature of 25C offers an enjoyable climate. From March to June temperatures can reach as high as 43*C. The hot humid days give way to the monsoon season that typically lasts from late June until September when rivers become flooded and most of the roads are virtually impassable. Mean annual rainfall of the park has been recorded 2150mm. In late January, local villagers are allowed to cut thatch grasses to meet their needs, which offer a better viewing of wildlife to visitors. Also, between September and November, and February and April, migratory birds join the residential birds and create spectacular bird watching opportunities. While the monsoon rains bring lush vegetation, most trees flower in late winter. The Palash tree, known as the “flame of the forest”, and the silk cotton tree have spectacular crimson flowers that can be seen from a distance. Chitwan National Park is situated in south-central Nepal in the subtropical lowlands of the inner terai of Chitwan, Makawanpur, Parsa and Nawalparasi districts. It lies between 27°16.56’- 27°42.14’ Latitudes and 83°50.23’-84°46.25’ Longitudes. The altitude ranges from 110m to 850m above sea level. The park is bounded by the Rapti and Narayani River in the north, Parsa Wildlife Reserve in the east and Madi settlements and India border in the south. The physiography of the park consists of the Terai and Siwaliks. Three major rivers Narayani, Rapti and Reu, and their floodplains; and several lakes and pools are the major water sources of the park. Being the first protected area of Nepal, it has a long history of over three decades in park management and rich experiences in nature conservation. Chitwan was a big game area for the royal families, Rana rulers and their guests. The area comprising the Tikauli forest from Rapti River to the foothills of the Mahabharat extending over an area of 175 km2 was declared as Mahendra Deer Park in 1959. 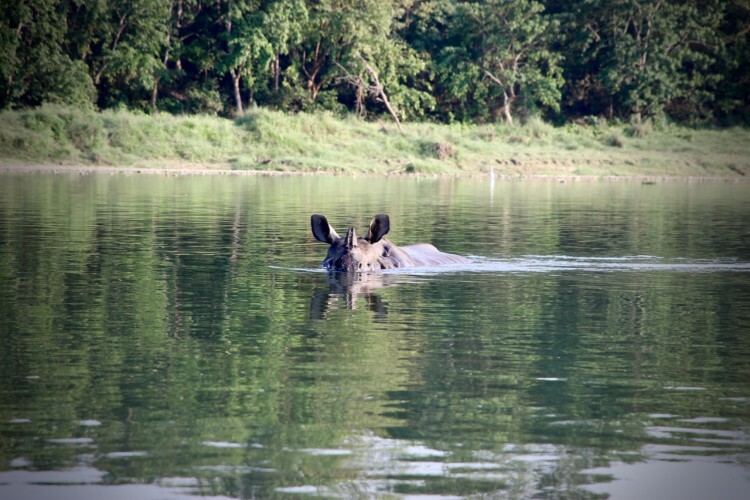 The area south of the Rapti River was demarcated as a Rhino Sanctuary in 1963. It was proclaimed as Royal Chitwan National Park with an area of 932 km2 in 1973. After the peoples’ revolution in 2006, the park’s name was changed to Chitwan National Park. In recognition of its unique biological resources of outstanding universal value, UNESCO designated CNP as a World Heritage Site in 1984. In 1996, an area of 750 km2 surrounding the park was declared a buffer zone, which consists of forests and private lands including cultivated lands. The buffer zone contains a Ramsar Site – Beeshazari Lakes. The park and the local people jointly initiate community development activities and manage natural resources in the buffer zone. The government of Nepal has made a provision of plowing back 30-50 percent of the park revenue for community development in the buffer zone.